Samarinda is the capital of the East Kalimantan province on Kalimantan Island. The city is lies on the banks of Mahakam River. As well as being the capital, Samarinda is also the most populous city in East Kalimantan with population of 562,463 in 2000 and used by many as a gateway to the more remote regions of the province such as West Kutai, Kutai Kartanegara and East Kutai. To reach these areas usually involves travel by river as the most efficient means. An airport, 'Temindung' and a port are the transportation facility in Samarinda, however, there are plans to relocate both the airport and port soon. 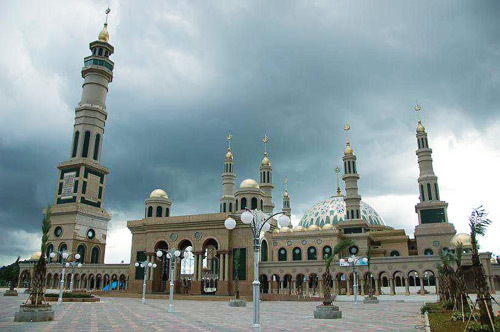 Samarinda's population includes Chinese; Banjarese, who are native to the southern part of the island; Kutais, who are native to the area around Samarinda; and Manu Muslims. Samarinda is big in timber production, but the main reason to come here to explore the Mahakam River and visit the Dayak tribes that live on the banks of the river. Isuy Bay is located on the shores of Jempang Lake. There is a longhouse craft center and tourist hotel. Dance performances are regular happenings, especially when groups of tourists arrive. 'Mancong' is another longhouse, where you can stay. It's a bit touristy as well. If you have time on your hands, you should head for Melka, which is some 30 hours by boat, but it has a great orchid reserve. Samarinda is wood industrial estate in East Kalimantan as well as important port town. The location is not far from Balikpapan but the city that populates about 500 thousand men, has different situation from Balikpapan City. For tourist, Samarinda is good place to start the journey to hinterland, fringe Mahakam River. Most of the resident in Samarinda is Banjarese from South Kalimantan, so that Banjar langua has often heard in conversation here. Banjar Language is the primary language in Samarinda. Besides Banjarese, the second of the biggest public group in Samarinda is Kutai and other society that come from other area. Most of Samarinda City region is located in north of Mahakam River. In the riparian of this Mahakam has stood a Raya Darussalam Mosque that becomes one of characteristic or symbol of Samarinda City. Mostly the important white collars and hotel reside in north of the river.